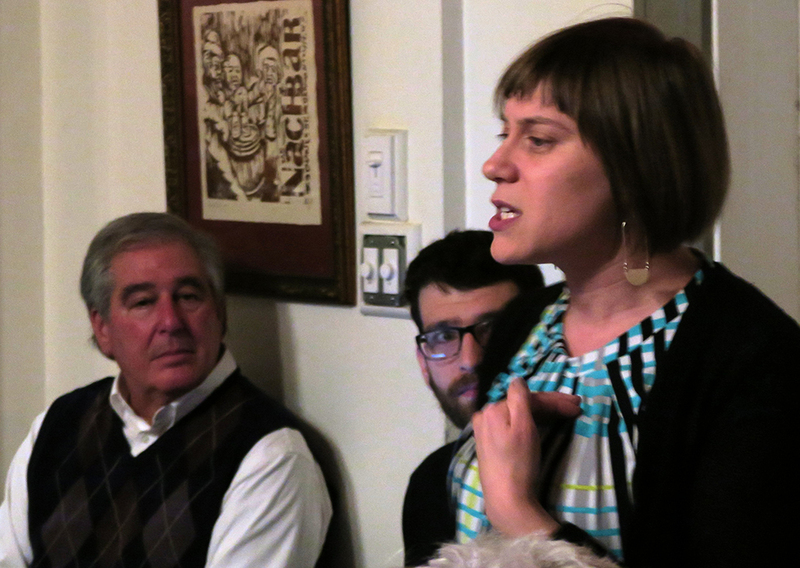 Waves of German-Jewish immigrants have left their mark on Louisville, Abigail Glogower said. The curator of the Jewish Community Archives at the Filson Historical Society, Glogower lectured on these immigrants during a Jan. 8 program at Eiderdown, a Germantown restaurant. The Jewish Outdoor Food and Environmental Education (JOFEE) hosted the event, which drew 40 people attended. Glogower showed pictures of logbooks of Louisville B’nai B’rith Lodge, from the 1860s. She explained that the lodge provided a way for new Jewish immigrants to mingle and network together, because most of the immigrants came from all over Europe, Eastern Europe and Russia. Louisville’s German Jews began coming in around the 1820s, though it wasn’t until the mid-19th century that there were enough to form a thriving community. When they arrived in Louisville, German immigrants were still disconnected from each other, Glogower said. When German Jews came to Louisville, they were mostly peddlers, Glogower said, because they had been limited in their careers back in Germany. Peddling was an easy way to get started in business. They would schlep around the countryside, selling wares to local people. Eventually, they’d make enough money to invest in a horse, then eventually to open a storefront, which is why so many Jewish store owners thrived in Louisville and other U.S. cities. By the 1850s, nativist and anti-immigration sentiment took over in Louisville and the rest of the country. In Louisville, this sentiment culminated in the Bloody Monday riots on Aug. 6, 1855, in which Protestant mobs attacked German and Irish neighborhoods and immigrants, preventing them from voting and causing the deaths of 22 people in the city. Little is known about the Jewish immigrant experience of Bloody Monday, but Glogower said the riots caused such upheaval in Louisville that many German Jews left the city for Cincinnati and elsewhere. Rabbi Isaac Mayer Wise, the founder of the American Reform movement, including Hebrew Union College in Cincinnati, was offered a pulpit in Louisville, but chose to stay in Ohio. By the 20th century, Jews in Louisville began building institutions, such as Jewish Hospital, which trained Jewish physicians, and the Young Men’s Hebrew Association, which eventually became the Jewish Community Center. Glogower mentioned her own German Jewish grandmother, who had completely disavowed her German heritage after World War II. Today, though, many Louisvillians are becoming more curious about their heritage and researching their genealogy. The Filson will host a half-day Jewish Genealogy Workshop with Avraham Groll, director of JewishGen.org. It’s 9 a.m. to noon, Jan. 29. Attendance is free for Filson members, and $20 for non-members. JOFFEE’s next Restaurant Night will be 6-8 p.m. Feb. 25 at The Table Cafe, a nonprofit restaurant in Portland. Register JewishLouisville.org.